Because of the "Number of the Beast" connotation, several horror movies and albums will be released on June 6 (6/6/06). Oh yeah, and the town of Farmington, Maine, will undergo a strange and wonderful transformation. Thereafter, there will be no death and no illness (except the remnants of earlier illnesses which will go away in three days or less) within the municipal limits of Farmington. Nor will there be any crime or bad behavior. You will be safe in Farmington; nothing will harm you here. The rest of the world is still the way it has been for millennia, so if you go outside the borders of Farmington you will not be protected in this particular way, though you will be no worse off than before. Licia Kuenning makes this prophecy on her webpage, where she also hawks her new book Farmington! Farmington! She insists that, though her book is fiction, her message is not. As she says in the FAQs (which I can't believe are frequently asked), she's just relaying God's intentions. Q. What will cause this amazing change? A. God will cause it by his own will. Q. Why has Farmington been chosen? Google Video has a three-minute short called In Pursuit at Penobscot that was filmed in Maine by Caleb Greene and stars two of his brothers as "the pursuer" and "the pursued." I don't want to give away the ending, but it may or may not involve someone getting caught. On Friday, May 12th from 1:00 - 5:00pm, come help out at a public planting and pruning day at the Eastern Cemetery! The cemetery is located at the start of Munjoy Hill on Congress Street. "Volunteers are asked to bring gloves, shovels, pruning shears, and if possible wheelbarrows. The City of Portland will be providing mulch, loam, and a water buffalo for watering the newly planted trees." Beverages will be provided for the refreshment of hard-working volunteers! 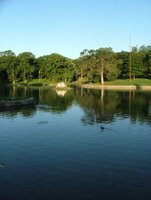 On Sunday, May 14th at 1:00pm, a 1-hour tour of the cemetery will be given. Get up close and personal with a serious piece of Portland's history! FMI contact Christina White at christina(AT)simonewear.com or 846-7753. Then on Tuesday, May 16th at 6:30pm, meet the new Archivist of the Portland Room at the Portland Public Library, Abraham Schecter. Abe will be running a public meeting in the Portland Room (Room 316) about his proposal to begin a neighborhood history project. Portland is a realm of neighborhoods, but few of us living in these areas today know their history. 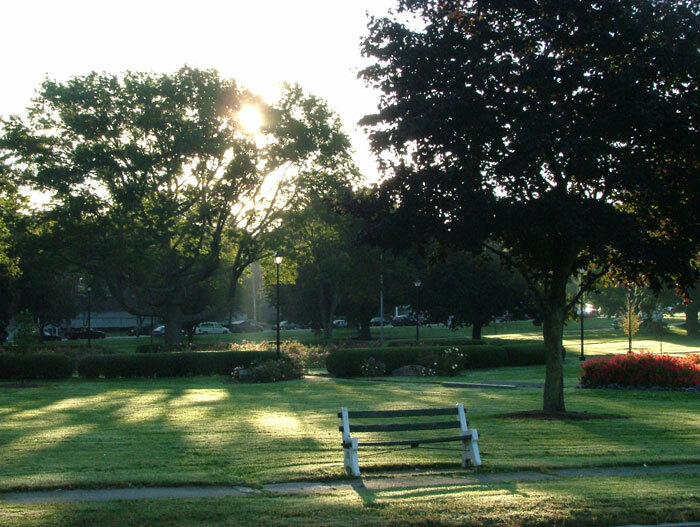 Take a step towards learning and preserving the history of the neighborhood you love, be it East End, West End, Woodfords, North Deering, Parkside, or what have you! Abe's e-mail is abraham(AT)portland.lib.me.us or visit the Portland Room online. A New Hampshire family has been thrown into the spotlight after the revelation that they have a mummified baby. The tiny corpse is considered a family heirloom and has been displayed in their home for years. The mummy baby was discovered in the belongings of a great great uncle after he passed away, and was handed down through generations. Family stories suggest that the child is the great great uncles stillborn son. Since the uncle was born in 1850, and the family believes the dead baby is around ninety years old, that means old Unc would have been sixty six when the baby arrived. In the news story I viewed, the current owner said the mummy baby was considered part of the family, and got slightly choked up over the possibility of losing the dead creepy heirloom. I guess if you’re going to display the mummified body of a potential ancestor in the living room, it’s good that you have an emotional attachment to it. If I found a mummified baby in my dead uncle’s possessions, I would be fascinated in a spooky weird way. I’m not sure what I’d do with it, but I sure as heck wouldn’t put it up in the house. I also wouldn’t pose a baby next to it for a photo, but then again, that’s just me. You can read more about this story in a lengthy article in the Concord newspaper. 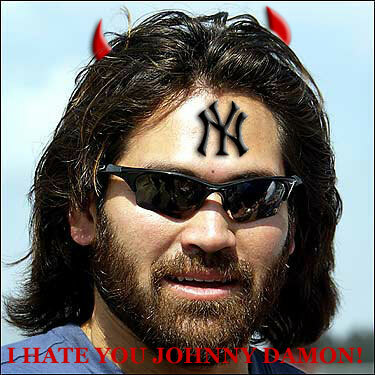 Like many of the Boston Red Sox fans who felt so rewarded for years of hounding and heckling by disbelieving rivals when the Sox trounced their enemies in 2004, Deborah Sroka was a wee bit outraged by the turn of events when Sox golden boy Johnny Damon deserted his team in search of more fullsome Yankee pastures, thumbing his nose at his loyal fans and shocking them with his turncoat behavior. In a recent interview with Mechele Cooper of the Kennebec Journal, the Augusta citizen mentioned that in addition to retiring her "18 DAMON" Maine license plate from her Monte Carlo's bumper, she has since engaged in somewhat more creative activities with some of her remaining Damon fan merchandise. "I've turned my Johnny Damon bobblehead doll into a voodoo doll, and it's kind of working," she said. "It seems like he keeps running into (walls). Maybe it will knock some sense into him and he'll come back to the Red Sox." She's not the only one, if a quick online search is any indication. ...eggs are starting to roll, I infer, from the glow starting on the wings of the resident goldfinches, the general twitterpating going on in the upper branches of the ash tree, and the tom turkeys floating about the orchard like Roman war biremes under full sail. Take that, Longfellow! Kapow!!! A turkey in the face of the stodgy poets of yore (whom we love dearly but would agree occasionally need a free-verse updating). PORTLAND, Maine -- Sometime this weekend, strange things have arisen in the pond at Deering Oaks. Someone has placed a most interesting structure on the little island in the middle of the pond where the red and white duck house is placed each year when the weather warms up. What is it, you ask? Well, from all appearances, it is a miniature toilet on a pedestal, mounted on four classical columns. Your correspondent was unable to get a closer look due to time constraints on her way to work this morning, but it appears to be made out of wood. It might also be painted gold, but it was hard to tell due to the flatness of the overcast early morning light available. Is this sanctioned Art in the Park, or is it a renegade installation by creative-minded guerillas? Did they trundle it out in a stealth rowboat? What is the artist trying to say??? If they're complaining about sanitation levels in the Park, a quick trip to Central Park in NYC should clear up any objections and give a sense of perspective. Perhaps the person is just potty about ducks, similar to myself and my roommates. 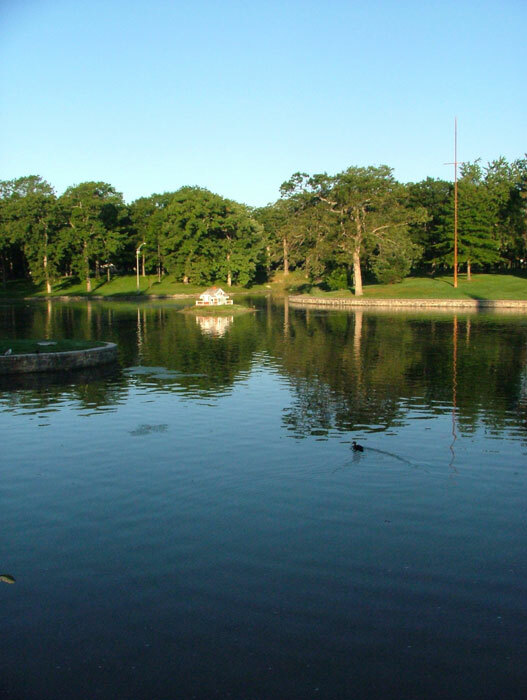 Photo showing normal state of affairs on Duck Isle, Deering Oaks Park, (c) Michelle Souliere. Fore Street is as integrally a part of Portland as the far busier main thoroughfare, Congress Street. Its crooked course, lined with rows of weathered often ramshackle, brick and frame buildings, indicates the contours of the original Portland waterfront. Fore and contiguous streets which once were lanes bearing such names as Love, Fiddle, Fish, Lime, Turkey, and Moose Alley were long the commercial and residential centers of the city, and comprise the district which suffered most from the fire of 1866. Longfellow recalled the Fore Street of his youth, with its "black wharves and the slips... and the Spanish sailors with bearded lips," when the fashionable residential section still lay east of Congress Street. Here on Fore Street were the counting-houses, chandleries, slopshops, saloons, lodging-houses, and the warehouses crammed with West Indian goods. ... Later on in its history certain section so Fore Street acquired an unsavory reputation. With the laying out of Commerical Street in the middle of the 19th century, Fore was relegated to a position of secondary importance, but suffered only light diminution of activity. .... Many of its buildings are the tombs of a former prosperity and, whereas midnight was once but another hour to the scores of brawling and carousing sailors who frequented the street, its silence is now broken only by an occasional, perhaps furtive, footfall or the caterwauling of the stray cats that live in the deserted lofts and cellars. In the 1960s art shops were becoming the vogue in the area. ... In 1850 increased trade and the projected railway to Canada seemed to demand better and more ample transportation and terminal facilities than were possible on Fore Street, which at that time bordered the water. Accordingly, in that year, Commerical Street, 100 feet broad, more than a mile long, with a 26-foot space in its center reserved for the railroad, was laid out across tidewater, running over the heads of the wharves. The area between Commercial and Fore Streets was later filled in; the drop between the levels of the two streets is noticeable today. Thus, leaving Fore Street stranded, Commercial Street became the focus of maritime activity and trade. Today the street is once again awash with carousing, though relics of its history are found tucked carefully along its length mixed in with modern treasures, including the wonderful presence of a very special red parrot named Singapore at the China Sea Marine Trading. I'm going to try to interview the parrot's human companion (Steve, the owner) in the near future, see if I don't! Photo of Old Port rowdies by Matthew Robbins, for The Bollard. 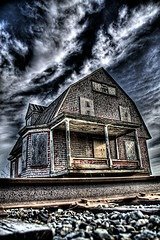 Check out this wonderfully spooky HDR photo uploaded to Flickr today by Lawrence eviL of Bangor. Its very appropriate title: "Condemned." Update (Apr. 20, 2006): Members of the Bangor Explorers' Guild have bravely completed a survey of this creepy old farmhouse, which "sits overlooking the Penobscot River, on a parcel of land right next to the Bangor Waterworks Building." Rex Turner asks a weird question in today's Morning Sentinel: What if animals had folklore and oral histories? He gives an example from his own family of an ancestor said to have died by drowning in a puddle, then tells of a dead squirrel he once found "floating in one of my sap buckets." There must have been a good story attached to that tragic event. Could moose take time out from munching aquatic plants to share an ice storm tale? I recall hearing that during the Ice Storm of '98, a limb broke and the sharp end fell on an adult moose, impaling the unlucky fella. I can't say I recall the source or that the story is true. I don't even know if the incident could happen. But if it did, would that be the type of over-the-top death to be remembered? And what would the kitten rescued Monday from an Auburn storm grate have to tell its children? Officials believe the kitten had been stuck with its head exposed on the roadway on the top of the grate and its body dangling below for several hours Monday morning. The kitten somehow managed to avoid being crushed by cars and trucks, but it remained stuck after police officers carefully lifted the 150-pound grate. The events described in this news item took place at a time in Maine when old superstitions were still alive, but on their last legs. It comes from The Eastern Herald and Gazette of Maine of Nov. 17, 1796. I've added a few paragraph breaks to make it more readable. The Courts of Common Pleas and General Sessions of the Peace for the County of York, were holden at Biddeford last week. At this Court and action was commenced on behalf of the Commonwealth against Elizabeth Smith and others, for an assault and battery on Elizabeth Smith, widow. In the course of the trial it appeared that in the month of October last the Complainant had been accused of witchcraft; and that not only her neighbors, but her relations had been so incensed against her, that she was obliged to fly to a neighboring town for safety. It seems that one John Hilton had, some time in October, become insane; and while in that state, accused the Complainant of having bewitched him. He said, that as he was going home one evening, just before dark, the Complainant appeared before him, and walked some time at about six yards distance; that he had an ox goad in his hand which he held by the middle; that presently he perceived the goad to move through his hand; that when it had passed almost out of his hand, being persuaded that it was the Complainant who was drawing it out, and that she did it by the power of witchcraft, he attempted to strike her; but instead of doing any injury to the Complainant, he himself received a violent blow on the lower part of the back; that the blow gave him great pain, &c.
Eaton Cleaves, witness on behalf of the defendants, further testified, that till the time mentioned by Hilton, he had been possessed of a sound mind; that he then declared the Complainant had bewitched him, and had ever since continued to declare it. That the Complainant had been requested to visit Hilton; and that while she was in the house he appeared to be much better, and talked very rationally; that it was proposed to obtain some of her blood as an antidote; and that she consented HER BLOOD SHOULD BE SHED. But notwithstanding all this, it appeared in evidence that the defendants had threatened her life, had said she ought to have been long ago in hell with the dunned; and that they would let loose the man whom she had bewitched, John Hilton, to kill her. Whether they let him loose or not is uncertain; but it is a fact, that he made his escape from the place where he was confined, and ran immediately to the house of the Complainant; beat her violently with a stick, drove her out of the house, then seized her by the throat and well nigh choaked her. While Hilton was striking and choaking her, one of the defendants, and niece to Hilton, cried out "kill her, uncle John." It appeared also in the course of the trial that other means had been used to kill her besides calling on "uncle John." The defendants had, to use their own expressions, "tried projects"—one of which was to boil uncle John's urine! This not having the desired effect, uncle John went in person. His honor Judge Wells, in an address to the defendants, endeavored to convince them of the groce [sic] error into which they had fallen; and that the difficulties and dissentions in the neighborhood arose rather from ignorance in themselves than from witchcraft in the poor old woman. The defendants were bound to keep the peace till June next, and thence till August. 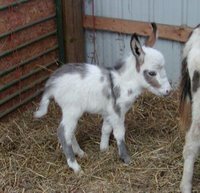 The New England Anomaly has posted a story this morning of a heinous heist in neighboring New Hampshire, where in the town of Barrington someone has been so brazen as to abscond with an adorable three week old miniature donkey. Roberta Henderson says the animal was stolen from her farm Saturday evening. She says if the donkey is not returned, it could die because it still needs its mother's milk. She says she just wants it back, no questions asked. Link to an account of the AP story here. The Hendersons run Grand Finale Farm where they have two herds of miniature donkeys totalling just over 30 of the cute little buggers. Perhaps someone thought they might have enough to share? If so, they should have asked before taking to avoid this tragedy. :( Poor donkey! To give you an idea of the cuteness level that we are contending with here, please examine the evidence. Do not tarry to tuck your tentacles in. Time is short! 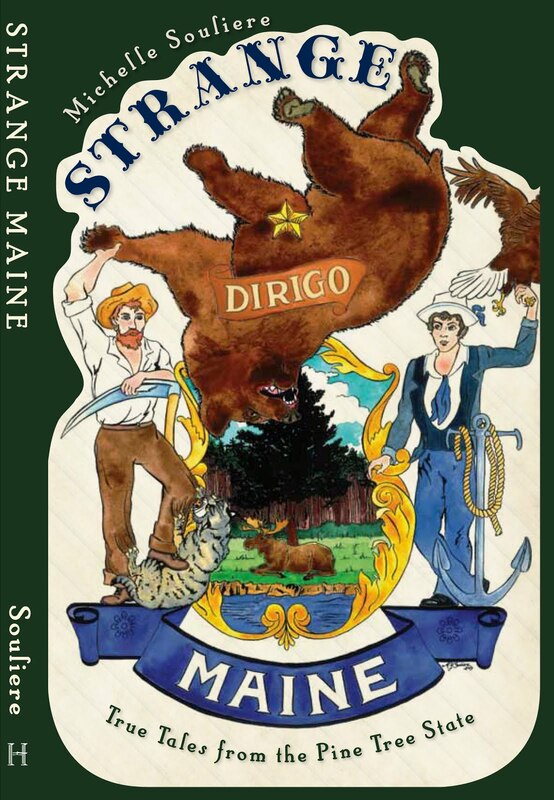 Hasten to Strange Maine (the store! at 578 Congress Street, Portland). 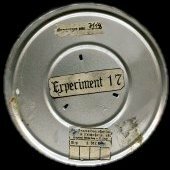 featuring the Maine premiere of Christian Matzke's "Experiment 17"
Be there, or be squishy. 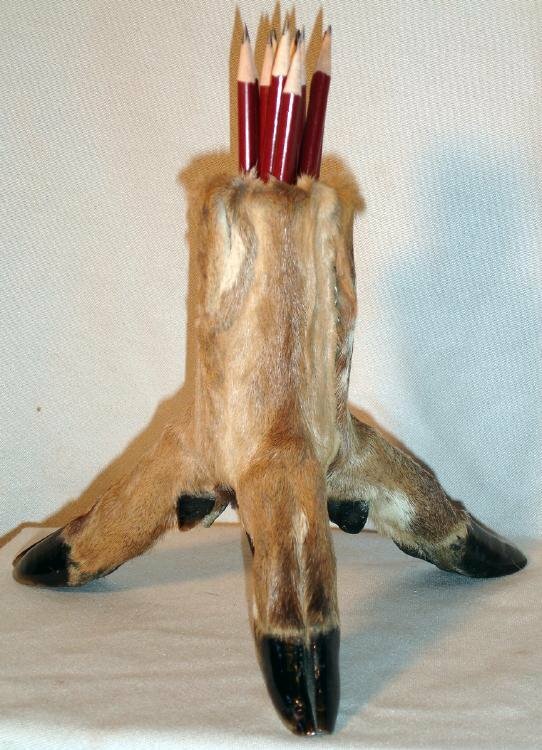 Being offered is a deer foot holder we found at an estate auction here in Maine. I haven't seen many deer like this one running around, must have come from near the old nuke power plant! This is a really neat piece of very unique taxidermy. I took the pictures with pencils and I will include these with the stand. It would also be great for a pipe or flowers! Stands 7.5'' tall, the widest spread on the feet is about 9.25". This mutant deer stand will make a great conversation piece! To check out the auction, click here. It ended the 12th, but if the reserve wasn't met, you can always e-mail them for more info. 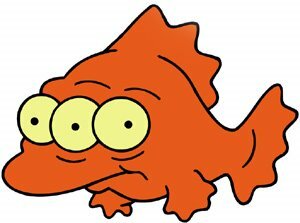 Strikes me as being sort of like the Maine version of Blinky the Fish from the Simpsons. A man known only as "Leigh" (he's "legally renounced his last name") was arrested last Friday for lingering in the Washington County Courthouse in Machias after closing. He handed a sheriff's deputy a note with his reasons for breaking the law, and for the 24th time was taken into custody for criminal trespass. It's debatable whether Leigh can be guilty of criminal trespass, because his only home is the county jail at the same address. He gets himself arrested on a regular basis to protest a 1993 conviction for reckless conduct with a firearm, which he claims was bogus. He's spent about nine years in the jail, and was released just last Wednesday. 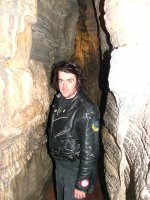 Chris D. has posted over at All Things Maine about Maine caves. Did you know that Maine has a Cave Protection Act? It was voted into law in 2001. Unlike our New England cousins in New York, etc, Maine does not, however, have any show caves, i.e., caves that are open for display to the public. If you want to go cave exploring in Maine, you're going to need to get down and dirty, and don't expect any pretty colored lights pointing out picturesque limestone formations. 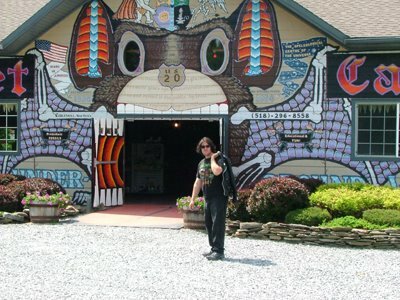 The Boston Grotto group of cave explorers has a great little gallery page of their visits to Maine caves, including some strange cave mushrooms, and a link to a page by Eric Hendrickson with a bunch of info about Maine caves. Is it possible that Lovecraft's character Edward Derby visited a Maine cave that was home to the "pit of the shoggoths" in HPL's story, The Thing on the Doorstep? "Cyclopean ruins" are mentioned, so it may just be some dank, antiquated basement in the Maine woods, but I'd like to think otherwise. Derby had been married more than three years on that August day when I got that telegram from Maine. I had not seen him for two months, but had heard he was away "on business." ... And now the town marshal of Chesuncook had wired of the draggled madman who stumbled out of the woods with delirious ravings and screamed to me for protection. It was Edward - and he had been just able to recall his own name and address. "Dan, for God's sake! The pit of the shoggoths! Down the six thousand steps... the abomination of abominations... I never would let her take me, and then I found myself there - Ia! Shub-Niggurath! - The shape rose up from the altar, and there were five hundred that howled - The Hooded Thing bleated 'Kamog! Kamog!' - that was old Ephraim's secret name in the coven - I was there, where she promised she wouldn't take me - A minute before I was locked in the library, and then I was there where she had gone with my body - in the place of utter blasphemy, the unholy pit where the black realm begins and the watcher guards the gate - I saw a shoggoth - it changed shape - I can't stand it - I'll kill her if she ever sends me there again - I'll kill that entity - her, him, it - I'll kill it! I'll kill it with my own hands!" Lovecraft isn't the only one to use Maine subterranean realms as a setting for fantastic madness. On November 4, 1948, Dr. Clark Savage, Jr., encounters what seem to be denizens of Hell in a Maine cavern. Dr. Karl Lenningen, a noted psychiatrist who accompanies Doc on this adventure, suggests that the experience was prompted by a subterranean hallucinogenic gas, but this does not seem tenable (Kenneth Robeson (Lester Dent), Up From Earth's Center). (this nugget found on a page with an excellent collection of fictive cave adventures) I'll try to get my hands on the full version of this tale and do a writeup on it for you all. While I have yet to explore any Maine caves myself, I did go to the Adirondacks a couple of summers ago and had a blast wandering around Howe Caverns and Secret Caverns. If you find yourself out there, do NOT neglect Secret Caverns -- it's just up the road from Howe Caverns and totally worth it. The one with the crazy bat-faced entrance is Secret Caverns, and the other is Tristan getting crazy from cave madness in Howe Caverns. This was sent on by Mari, the moderator of PaganHistoryMaine. Sounds pretty good to me! I'm not sure where they are in the planning stages, as this message is from 2 1/2 years ago. I'll let you all know if I find anything else out. 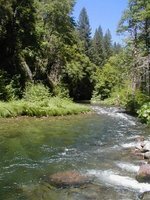 Just wanted to run our plans by you all...My wife and I are in the pre-stages of buying approximately 100 acres of land in Northern Penobscot County, Maine, for the sole purpose of building a retreat/campground. We are in the process of researching the necessary permits and licenses. "You have finally left for that well deserved, long awaited vacation...You travel along Interstate 95, and as the miles drift by, you begin to wonder if this trip will be worth the time and effort. You exit and after a short drive you turn onto a dirt road. You travel a short distance further and arrive at a parking area. You park your vehicle and notice several wooden wheeled carts located at the corner of the lot. A small sign next to the carts explains that since no vehicles are allowed in the camping area, the carts are used to bring your gear from your vehicle to your cabin or tent site. fireplace with more log benches in front. the various handmade crafts situated on shelves around the room. You register for your site and receive a small stone with what appears to be a Celtic or Gaelic symbol carved into it. As you exit the lodge you notice on the other side of the site that there are a series of pathways leading into the forest. You match the unique symbol on your stone with the same symbol on a carved sign beside one of the paths. There is also a small fire-pit in the front along with a wooden table and benches. After getting situated you head back to the main lodge site and as you enter the clearing once again, you notice that one of the campers has removed a harp from her case and is sitting in the middle of the stone circle playing a magical tune. 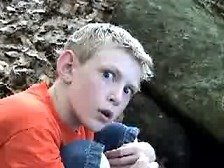 Other campers are just returning from a hike along one of the many pathways through the forest, commenting on the deer they had seen drinking from a nearby pond. Other campers are sitting in a nearby lean-to working on some crafts that they will take home to help remind them of this peaceful time and place, or they may decide to donate the item to the campground to be sold at the craft shop to help pay the yearly taxes...etc. As you take a deep breath, your mind takes in the sounds and smells of the forest mixed with the smell of a distant campfire and maybe a little incense in the air. You decide to check the bulletin board to see if there are any classes or entertainers scheduled for the night. Seeing that you have some time on your hands, you decide to take a stroll into the community garden to do a little work. As you enter the garden, you think to yourself that this was well worth the trip..."
volunteers to help with construction etc... Let me know what you think. Since we seem to be on a current events streak this morning... 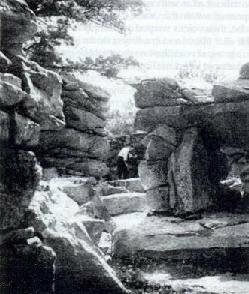 The New England Anomaly mail-list has posted information about a showing of a documentary about some of New England's mysterious stone ruins, as announced in the Sharon Advocate last Friday (April 7). On Saturday, April 22 at 7:30 p.m. at the Sharon (Massachusetts) Fish and Game Club, 303 East Street (just north of Billings Street), Sharon Friends of Conservation, The Sharon Garden Club and the Sharon Historical Society invite all to attend a screening of "Hidden Landscapes" - A video documentary by Theodore Timreck. Shrouded in myth and controversy for decades, the mysterious stone ruins found in Eastern North America have now become the focus of a new research initiative that is quite different from the efforts of the past. New, working collaborations between professional scientists, Native historians and the amateur, antiquarian pioneers of stone monument research have brought their perspectives together. Working in partnerships, they have begun to show that many regions and communities in the Northeast may contain an important archeological legacy of monumental landscape architecture with deep roots in the American past. In connection this showing, a specific site in Sharon will be discussed. Theodore Timreck has won a Peabody award and a Smithsonian Award for his documentary work. His anthropological works include: A portrait of Franz Boas, The Lost Red Paint People and Vikings in America for PBS (Nova). Please note location of this event may change if a larger audience is anticipated. Please check the Sharon Advocate the Friday just prior to the event. For more information, contact Kurt Buermann at 781-784-4625 or kurtb7(AT)juno.com. If you are curious about these sites, or have never heard of them, here is an interesting excerpt from Great Ireland in New England, a quoted chapter from "New England's Buried Treasure" by Clay Perry, 1946. At the very bottom of the page is a list of many sites, including those in Maine. 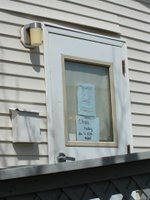 For those interested in New Hampshire's Mystery Hill, here is a good timeline of the property on the Old New Hampshire Magazine website. Photo of Mystery Hill by Malcolm Pearson (1946). I will haul the canopies ..
* Gather at Popham Beach State Park in Phippsburg around 10-10:30 a.m.
* Last year we didn't have enough room on the maypoles. So if you have a great big, um, length of wood you would like to bring, load it up! * Bring food for yourself and some to share. There are barbeque grills available at the site, and picnic tables. * Bring sunscreen, drinking water, extra layers of clothing (it gets windy at the beach!). * If you like, bring beach toys and musical instruments. You will have to pay a small fee to enter the park. There are toilets. Some mobility-impaired or older participants stay up in the picnic area, so if you aren't sure you can manage the whole trip to the beach, you'll probably have people to talk to. Ancient Riders in Maine, and all who can make it from elsewhere, will be holding a Blessing of the Steeds ceremony in conjunction with the really cool Beltane on the Beach at Popham Beach State Park. 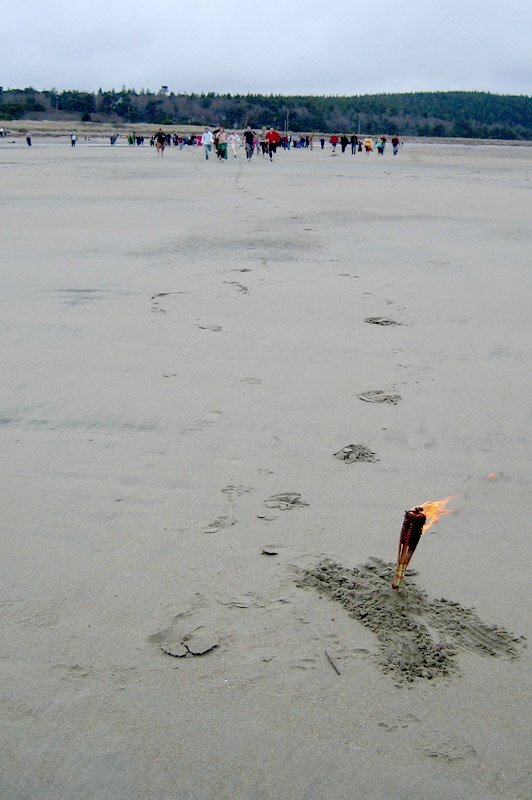 The Beltane ceremony is pretty early this year, due to tide schedules, followed by the Torch-Race honoring Pan (see links below, this is really cool), and a potluck barbecue lunch and social time. The date is April 30, a Sunday. Bring running feet, and try to win the coveted Pan/Laurel wreath pendant by honoring Pan with fleetness! Bring munchies, something to grill, whatever, and meet many of Maine's very cool Pagans! Bring 9 yards of a fabric ribbon, and participate in one of the coolest Maypole celebrations around! (links below) Or just show up on your scooter in the afternoon, and get that extra edge that only the Gods (and some furry idjit chanting runes in a utilikilt) can provide! Fine-tuning may be needed, but it looks like around 2:00 would work for the Blessing, in the generous parking lot at the site. We'll try to post details on www.ancientriders.org as the plan firms up, but wanted to give people as much notice of the date as possible--we hope some of you can make it! 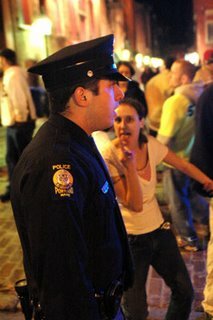 and the best photo selection is by Phabulous Prophessional Photographer Michael Berube anothermaine. 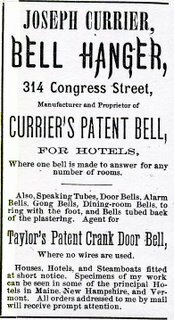 If you look through old City Directories, you'll see advertising for occupations that no longer exist, and businesses that have morphed into some new fangled vocation. The following ads come from Portland City Directories between 1869 and 1891. This ad leads one to believe that people must have been really into pickles. Nitrous Oxide is this dentist's main marketing tool. No longer are the terms "eating house" or "refreshment saloon" in everyday language. This one I find the most fascinating. Does the occupation of Bell Hanger still exist? 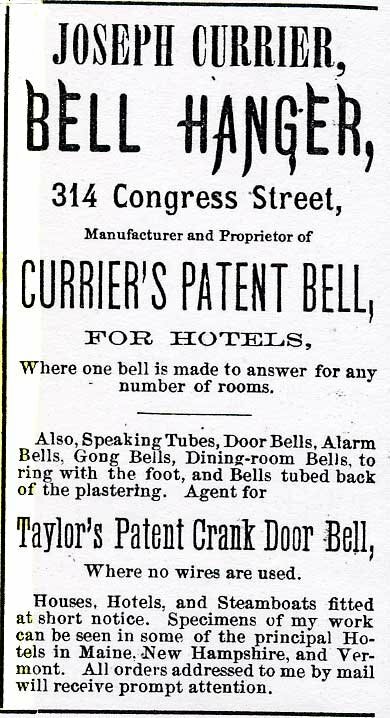 I love that Currier invented his own bell system for hotels. And he also installs speaking tubes? Fantastic! Vote on Horror Movie Poster! 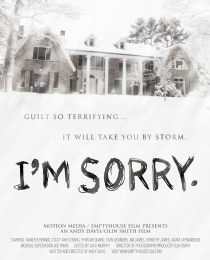 Vote on which of three excellent poster designs Maine film company Emptyhouse Films should use for the release of their new film, "I'm Sorry." In recent months, there has been strange and foolish shelf activity at the Portland Public Library's Burbank branch, by Deering High School on Stevens Avenue. Some disturbed soul has been going into the branch on a regular basis, and taking the time to rearrange books around each given room in a mania of misshelving. This is taking library staff hours of manpower to keep up with. Books are taken a few at a time from various points around the room and systematically reshelved in random spots elsewhere in the room, creating a patchwork of out-of-whack reference material. More recently, destructive urges have arisen, and mischief is turning to outright vandalism and defacement of property. DVDs are taken from their cases and stowed naked behind upper shelves, out of sight and vulnerable to destruction by scratching from movement of the books on the shelves they are hidden behind. Spines of books have been intentionally destroyed. A whole shelf of Shakespeare was reinserted throughout the entirety of the non-fiction room. What started as whimsical seems to be turning pathological. Burbank is the city's busiest branch, though not its largest by far. Staff are kept busy at the front desk, and are only able to make cursory patrols throughout the facility, which the bandit is taking full advantage of. If you are in Burbank and happen to see someone making haste with making waste of the shelf order, please note their description and tell your librarian! 3. Or other strange reason. According to the Comprehensive Plan of the town of Thomaston, "the rivers and streams in town are very important for such species as alewives, striped bass, and eels." Said eels being the common American Eel or close relatives (I'm guessing), not necessarily giant eels, I'm sure. According to the Spring 2004 issue of the Maine Department of Marine Resources' "Recreational Saltwater Fishing Newsletter,"
line and may possess and transport the eels that person has taken. It is unlawful to fish for, take, possess or transport more than 50 eels per person per day. The Eel Liberation effort by the so-called Eel Huggers (eee! slippery!) 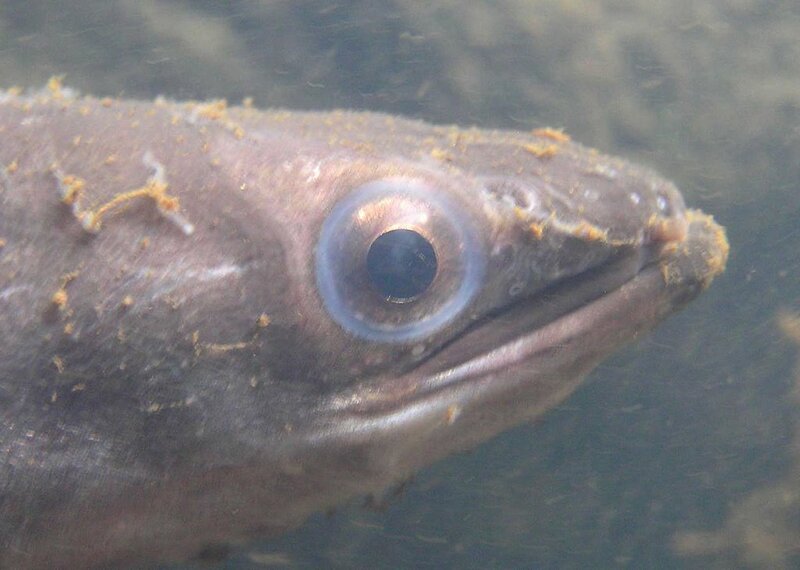 stepped up its activities recently in January as hearings about the eels' plight appeared on the schedule of the Maine Board of Environmental Protection, according to the Penobscot Bay Blog. There is also a fantastic photo gallery which allows you to follow baby eels in their attempts at migration over dams and more. American eel are among the longest-living animals in North America and one of longest-living fishes of North America. Female American eel in northern latitudes reach ages of 20-50 years old before their sole spawning migration to the Sargasso Sea. A record exists of an American eel living 88 years in captivity (Gail Wippelhauser, Maine Department of Marine Resources, personal communication to Douglas Watts, 1996). The Maine fact sheet for them is short and sweet, and gives us a good idea of how big they get normally -- males never seem to get much past two feet, but the ladies grow up to 6 feet in length (just more of them to cuddle, folks)! So how big is "giant," anyways??? 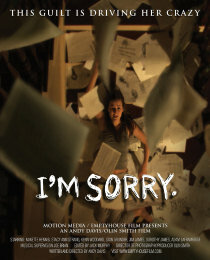 official trailer for horror film I'M SORRY. www.emptyhousefilm.com just turned a brand new leaf -- an interactive leaf, if you will. 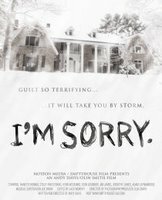 With the inception of the new website for their horror film I'M SORRY, the team of Motion Media and Emptyhouse Film invite you to try out interactive flash based games based on characters from I'M SORRY, as well as vote on the official poster art and view the official movie trailer for I'M SORRY. "We have been heading towards this for a long time now. After jumping leaps and bounds in the corporate training world, we just felt we had to up the ante," said Motion Media President Olin Smith. In addition to the interactive games, poster contest and trailer, a new forum is now open to the public and future additions will include a 30 minute "behind the scenes" featurette, as well as a downloadable video featuring world famous cryptozoologist Loren Coleman discussing the argument of "mind vs. haunting." "I'M SORRY is our second full length feature and our first real horror film in awhile, we wanted to really come back with everything we had in us, to really put our creative juices to work…and I think with I'M SORRY, we really did that." Said writer/director Andy Davis. I'M SORRY asks the questions "What is paranormal and what is just abnormal?" Both Davis and Olin Smith (MUD), the film's producer/cinematographer had previously worked on several paranormal "ghost hunting" shows and knew they wanted to incorporate one of the most important factors in any case they studied…the capabilities of the human mind. Filming in a stone mansion that was built in 1907 certainly set the stage for this gothic thriller. "I'm scared just looking at some of the dailies, seeing the emotion drip off of Nanette, it's freaky stuff." said producer/cinematographer Smith. "Going into this, we were certainly inspired by films like THE SHINING, THE CHANGELING and REPULSION, among others, we set out to make a film about one woman's insanity living in a spooky old house by herself and from looking at the final cut of the film, we did not fail to deliver the goods," said Davis. As well as being busy with I'M SORRY, Motion Media and Emptyhouse film are getting positive feedback from their first feature MUD. "It's really been a wild ride, we've gotten such great feedback from most everyone who watches it…they just relate to it in so many ways," said producer/cinematographer Smith. More information on I'M SORRY and MUD can be found at www.emptyhousefilm.com. Emptyhouse Film, a film production company based in Porter, Maine, and Boston, is owned by Andy Davis and Scott Morabito. Their credits include MUD, TV Nation (Best Music Video, Best of Show AIP Video Awards), Mechanazoid (*** -Film Threat Magazine, The Pumpkin Man, The Dark, Beneath the Frost Line (Commended – Festival of Fantastic Film, England). Way back in the early days of Strange Maine, in November 2005, I posted about one of Maine's more unique ghost towns, Flagstaff. I just picked up Fessenden S. Blanchard's Ghost Towns of New England (1960), and it has a whole chapter on the subject, so expect to see more on the underwater town soon. "I didn't mind so much having to give up our home," said one of the flooded-out inhabitants. "What I did not like was having to move the bodies of my father and mother to another graveyard." "We were one happy family and now we're scattered all over the place," another former citizen of Flagstaff mourned. "Did someone tell you about Captain Wing's idea of a Noah's Ark, so that we could all still be together?" 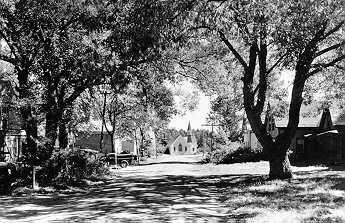 Photo of Flagstaff Village from the Maine State Archives. Well, I just went over to get a coffee and see if I could wrest my mom away from her work (she's an advisor), and found all of USM is closed due to a bomb threat. Only really strange in that being a university, most of its students are paying for their education (unlike high school students), and thereby bomb scares are few and far between, since pranksters are for the most part eliminated from the equation (my modest guess on the matter). Scooted over with a camera and got some on-the-spot shots. 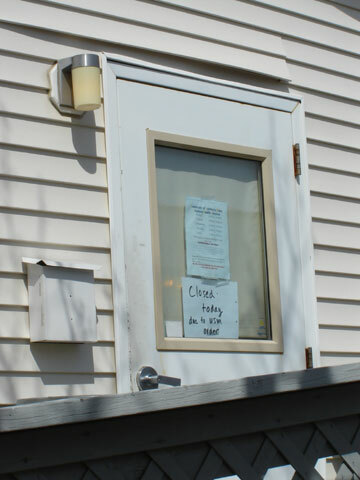 Signs on the doors at the Campus Center are shown, and on the Health Services door (slightly more stern). Also a gaggle of news reporters are collected in front of the Police and Safety offices, spotted as I departed. 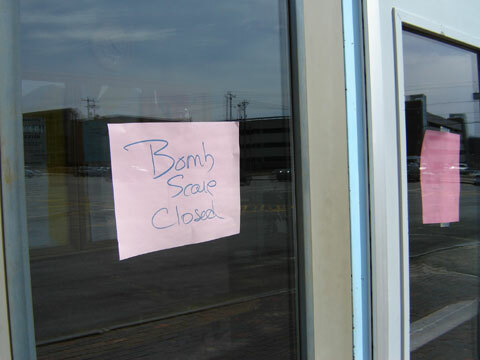 Other signs, on the doors leading to the bookstore, stated the building was only closed "until 4pm", as though the bomb scare goes away after a certain hour. Hmmm. 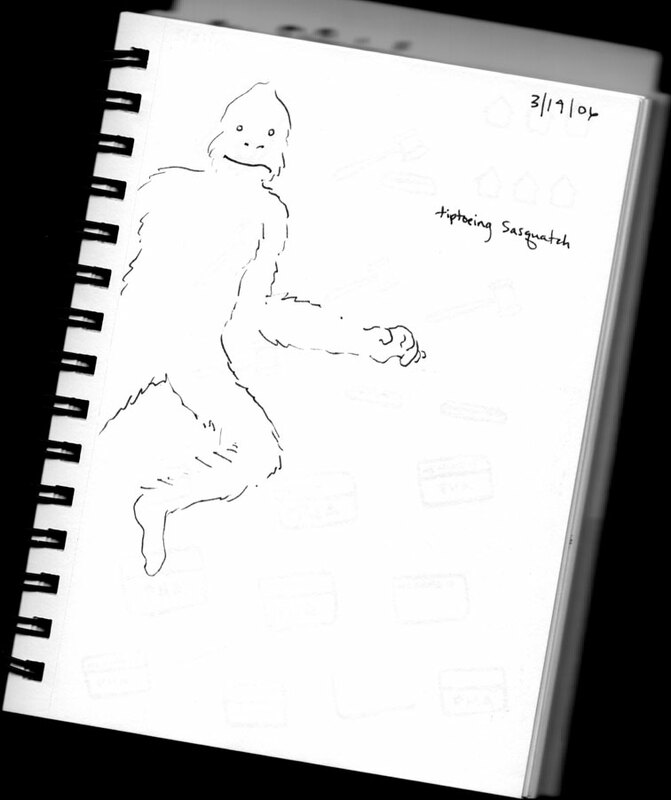 If you are a witness to any of the denizens of the crytozoological world (Bigfoot, sea serpents, lake monsters, mystery big cats, and so on), and have drawn a version of what you saw, Loren Coleman would like to speak to you about showing your eyewitness depiction in the “Cryptozoology: Out of Time Space Scale” exhibition. This wide-ranging show will start at Bates College’s Museum of Art, showing from June 24 to October 7, 2006, following which it will travel to the Kansas City Art Institute, showing there from late October to December 2006. Well, listen, I have to say I totally blew it. I could have posted something REALLY crazy for April Fool's day and I didn't. I just totally spaced it. And the Llama Hunting story doesn't really count, because I sure as heck didn't come up with the idea. If I had been thinking, I would have hung onto the story about vengeful Colonial-era spirits in Back Bay by Bob Bergeron of the Banner (the Portland Banner, that is -- ohhh but the "Portland" part would have ruined all my alliteration!). So now would be a good time for all of you to read it again (pretending, of course, that you read it the first time I posted this little masterpiece). At any rate, I promise that for April Fool's 2007, we will have a bang-up good time. March 6, 2:45am -- A suspicious vehicle was reported along Windham Center Road near St. Anne's Episcopal Church. Officer Edward Dubie investigated to find the subject was delivering newspapers. Yes, we are very suspicious about bearers of news these days, aren't we? P.S. I wonder what the caller was doing up at 2:45 in the morning?